Mystery of the Missing Crêpes! It’s the end of the year and my motivation (read: everyone’s motivation is waining) so when our Science Specialist approached me about a collaborative project together, I knew I had to do it. 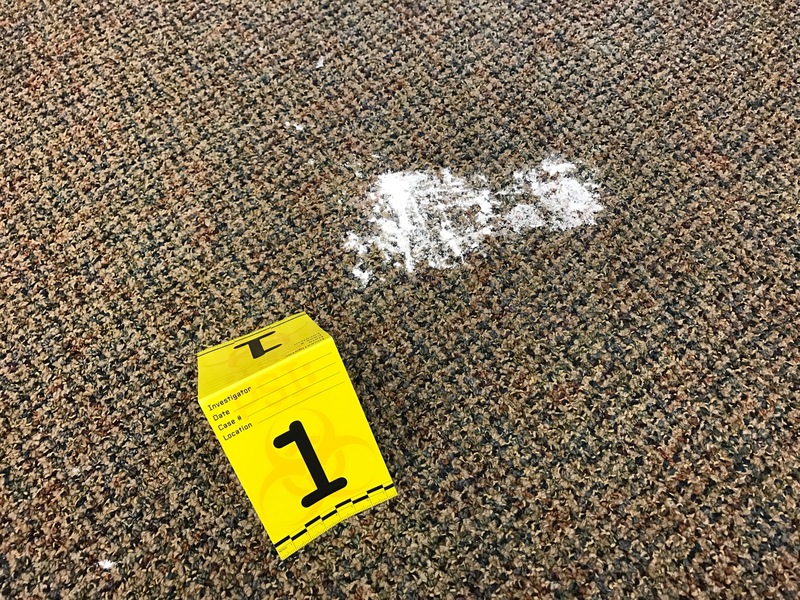 We came up with a crime scene idea for first and second graders (our classes are multi-age) where students use Forensic science in her classes and use French to create a report to send to the French police with motives and circumstantial evidence. This was maybe the most fun I’ve had at work? Definitely in a long time! Here was our process if you wish to recreate! 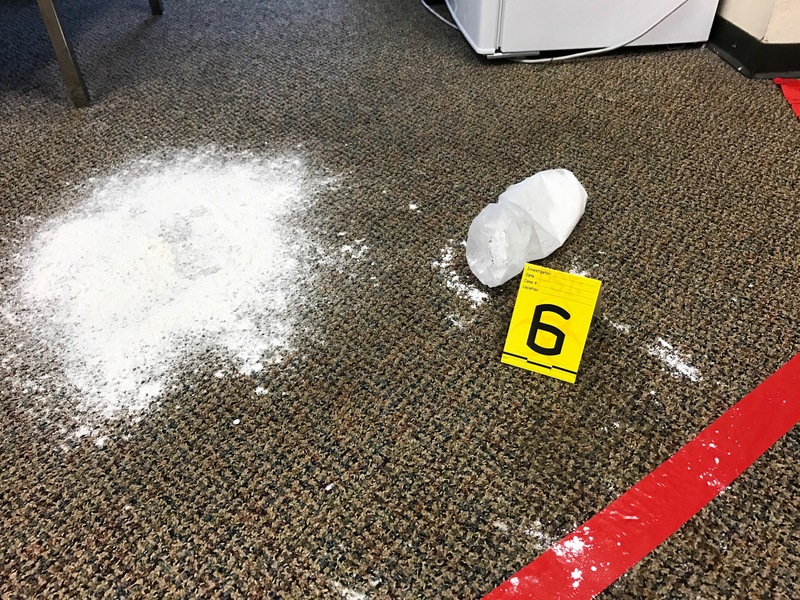 2) A bag of what looked to be powdered sugar, spilled over, with a tennis shoe footprint in the middle. 3) A coffee mug with a lip stain. 5) Some short, blond hair fibers. 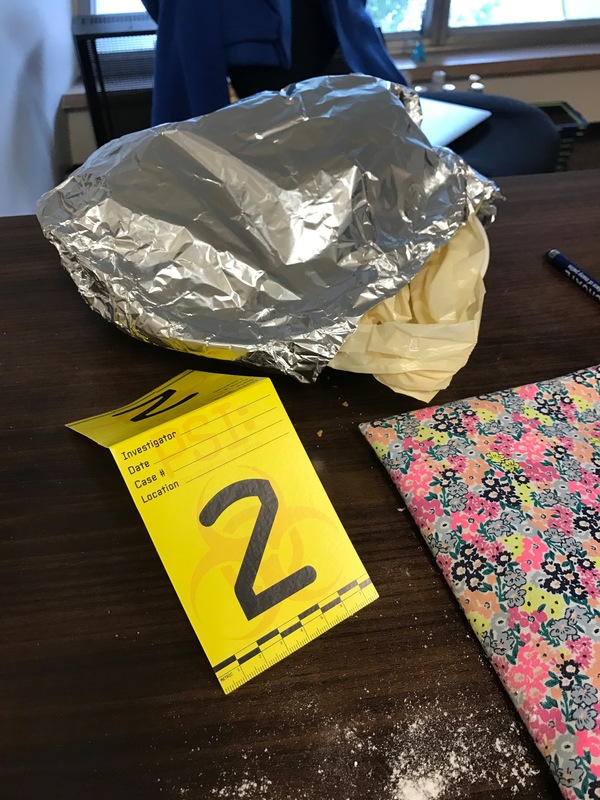 After a group assembly we held first and second graders after and I brought down a plate covered with foil and exclaimed, “It’s been such a great year, I’ve made crêpes for all of you to enjoy in class!” I then gasped as I uncovered the plate to reveal that the crêpes were missing! Our Science Specialist stepped in to say that her classes would help get to the bottom of this! I knew that it would be cruel and unusual punishment to spend the first class with them INSISTING that they speak only French. They are 7 and 8 years old and have French for one hour per week–there’s not room for THAT MUCH circumlocution in class. So, I let them speak English to me and get all of their ideas out. 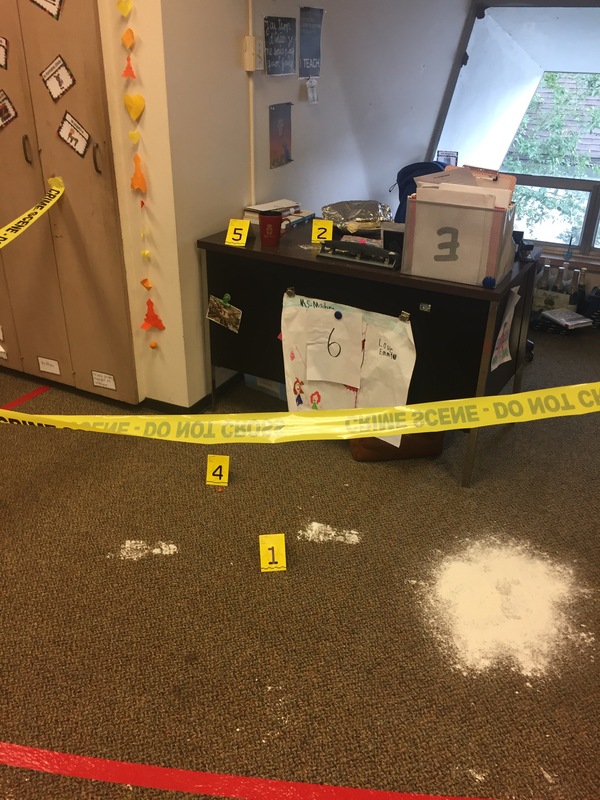 I am SO GLAD I did this because it set the tone, motivation, and made the engagement that much stronger when we did get into French in the following classes. I told them that because this was a crime against French humanity that the French police had to get involved. Unfortunately, they don’t speak English so we have to create a report in French. Y’all, they bought this. It was so magical because just like things like the tooth fairy and Santa Claus they WANT to believe in magical, mysterious things. Plus, it gave them an audience and a purpose for having to speak French. Class 2: Using this google slide presentation we evaluated the possible incriminating details of each suspect (in French!) using the following questions: Do they like crêpes? Do they like Brown University? Do they wear tennis shoes? Do they have short, blonde hair? Do they speak French? Do they have a key to enter? (Here is a video of what this looked like in class. Bonus! My good friend Matthias, in France, recorded a message of himself pretending to be the French police. We watched and decoded what he had to say. You can see his video here. It was great, because the signs linking to everyone were in French, so outside of class students were excited about reading French! Many stopped to show their parents and translate for them. It turns out that it doesn’t really matter who committed the crime, since the language goal was many repetitions of the words ‘aime’, ‘porte’, ‘parle’, and ‘a’ (likes, wears, speaks, and has). But for fun, we ended it with the culprit being a student’s mother who works at our school who just couldn’t get enough of the crêpes. 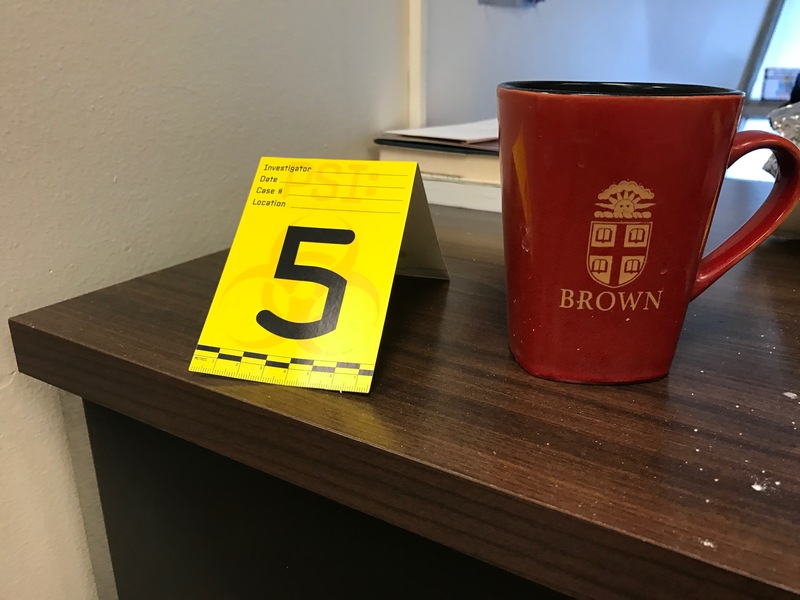 She was someone who wasn’t a suspect but fits all of the incriminating details perfectly, so it was a big twist ending. She ‘gave’ me a gift certificate to buy more ingredients for crêpes and we’re enjoying them in class this week. You are amazing Madame Richards. Annika can’t stop talking about your class and this project. She loved it. Thank you for continuing to make French so much fun! Génial !!!!!!! Bravooooo! You’re a star. I’m really impressed and I totally admire you! I really think this was great. I loved seeing the young students working together. Country Day has the best teachers ever! So creative and cleaver! Tres bien! Makes me proud to be a graduate of MPCDS! Thanks for sharing this beautiful, inspiring story about making learning fun. This is the CUTEST, most awesome and engaging lesson ever! Way to go! Your students will always remember this. You ROCK, hermana! This looks like so much fun!! I need to find a teacher to collaborate with and do this with my elementary students! Previous Previous post: Best Day Ever!